For this recipe you will need to have your MOLE, Pulled Pork and Fresh Masa or Masa from Masa Flour already prepared. Soak your Corn Husks in hot water preferably over night. I used a weight to push them down to keep them under the water. Once you have everything ready it’s time to start preparing your Tamales. Take a corn husk and lay it on the side with the smooth side up. Spoon a small amount of Masa onto the corn husk and then place a piece of plastic wrap on top of the Masa. Now use the side of your hand to ease the masa out so it forms a rectangle in the middle of the corn husk reaching the top edge. Remove the Plastic Wrap and place some pulled pork on the masa, top with some mole and now it’s time to make your parcel. Gently lift one side of the corn husk over to meet the other side so both edges of the masa touch. Now roll the corn leaf around until it is firmly wrapping the masa. 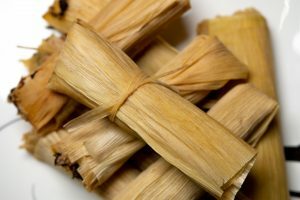 Tuck the bottom edge up over the seam and then take a small strip of corn husk to tie a loose knot to secure the Tamale. It’s probably easier to watch the video for this stage. To cook the Tamales place a small ramekin in the bottom of a large pan. Add enough water to come 3/4 of the way up the ramekin and the pop a plate on top. Lay the Tamales cross hatch onto the plate. Top with extra corn husks and place the lid of the pan on. Bring to a gently simmer and simmer for 1 hour. 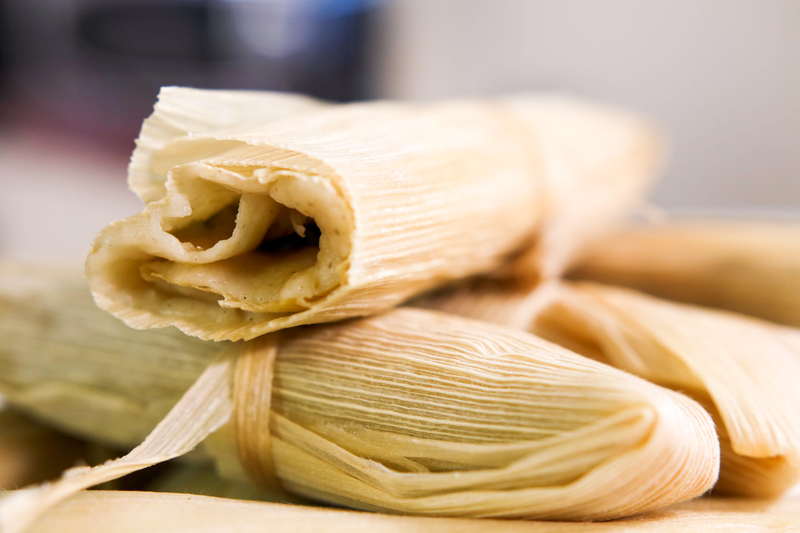 Your Tamales are now ready to be enjoyed.